Minimal art in the Crèche tradition tends to freeze facial expressions into some distant interiority. Each figure is a world in itself celebrating the beauty of self-containment and separation. It no longer holds true then that “nobody is an island?” There is one redeeming factor: the eyes. 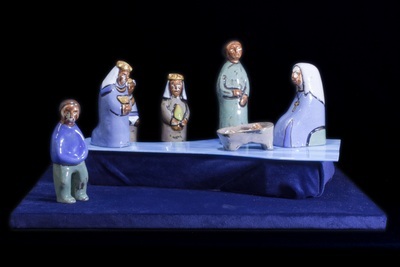 They seem to utter the northern proverb: “Blue are the hills that are far away.” And so this set became the “blue nativity.” A superficial observation of the figures may give you the blues. A second look may rekindle the conviction that distance lends enchantment to the view, a distance that allows for the whole picture, not some ephemeral sentimentality or backward bent nostalgia. The whole picture is Christ yesterday, today, and tomorrow… a sure cure against the blues. Eight pieces, made of glazed ceramic. Figures depict Mary seated with a large cross on her breast, Joseph, Jesus in manger, three kings, and a shepherd. Exhibition label originally written by Fr. Johann G. Roten, S.M. for exhibit entitled "Elisabeth's Nativity House: The van Mullekom Collection" held at Roesch Library, University of Dayton.